It's a Rambo pin! 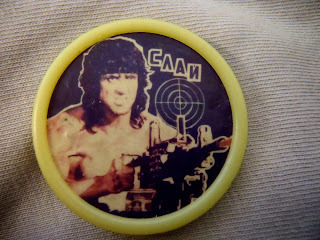 It says "Слай" which is Russian for "Sly" which is short for "Sylvester", as in "Sylvester Stallone", the actor who played Rambo in 4 different movies. Yea, I thought it was pretty sweet and about had a heart attack when I saw it. That is all.